A tweet from Max [email protected]_News_ claims that production has started on the Samsung Galaxy S10. If this is true, fans of the Galaxy S series can expect to be inundated with rumors and leaks over the next few weeks as information escapes the manufacturing facilities. It would make sense for the South Korean company to start production now if the rumored February launch date is accurate. Samsung followers and those eager to get their hands on one of the upcoming Galaxy S10 devices will be pleased to read the latest rumor that has reached Twitter – that production has officially started on the flagships. Of course, it pays to be somewhat skeptical of any rumor concerning the S10, especially as it has been subject to a flood of leaks and tips already. 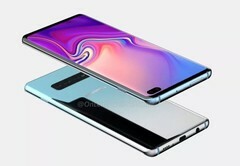 It is widely believed that Samsung is planning on holding a launch event on February 20, 2019 for the new devices, so obviously production would have to start soon anyway. A sales date of March 8 has been put forward, and it seems likely the South Korean manufacturer will be expecting huge orders. Samsung needs to have a big hit with its S10 series. Huawei has been snapping at Samsung’s heels for the #1 spot as the world’s biggest smartphone seller, and although the Galaxy S9 and S9 Plus received very good reviews, sales probably haven’t been as high as the company expected.